Warzone War Stories: "From Nowhere"
A squad of the feared Etoiles Mortant pursue their target on Luna. What’s their real agenda, though? Sewer systems are terrifying places. It’s not necessarily that they’re big open lanes of fire with no cover. It’s not necessarily that they’re dark and anything could be hiding in them. In Jelena’s case it was just the sound. Sewers in this part of Venus seemed to combine three sounds: the slow, steady gurgle of effluent waste draining away to places unknown, the ringing sounds of movement across the manhole covers above them, and the sound of her own heart beating. Jelena silently wished for the hundredth time that the infernal sound would stop. A small, intellectual part of her brain told her that nobody else could hear her heart beating, that it was just the rushing sound of blood in her ears. In her adrenaline-infused state, however, animal instincts nearly drowned that small voice out. Here in the tunnels, there was nowhere to go to escape that sound. Jelena came to a corner and paused, holding her Punisher handgun in both hands. The pistol was large and heavy, but it was yet to let her down. A handful of notches along the slide was testament to its stopping power. However, there were far more notches on the guard of her short sword, sitting snugly in its holster at her hip. Satisfied that there was nothing waiting around the corner, she turned and nodded to Daantje. The other woman nodded back, her brown braid wrapped around her scalp like a hat. Jelena stood and began advancing smoothly down the tunnel, the rubber soles of her boots silencing the noise of her footsteps. The radio headset buzzed in her ear, seemingly far too loud for this small space. «Unit one, are you in position yet?» Jelena paused and counted the turns since they had started. Forty eight… they had three to go. Close enough. She clicked her transmit button twice in response. She picked up the pace, extending the length of her stride as much as she could. Behind her, Daantje and the others kept up with her easily- Jelena’s short and stocky frame was completely at odds with her heritage, and her short legs were no match for her sisters’ lengthy strides. She paused at another corner, her desire to reach the mission area on time warring with her desire to not get shot. She forced herself to wait the required time before advancing. Another corner, and another. She had never been so relieved to see a ladder in all her life. Jelena studied the two branching corridors and the main ladder carefully before deciding that they were in position. She gathered her squad close and whispered to them. “You all remember what the target looks like?” Five nodding heads. “They should come along this road soon. Danntje, you will call the timing with the periscope. Everyone else be prepared to leap when the time comes. Once we are on the motorcade’s vehicles, it’s every woman for herself. Begrijpen?” Nodding heads again. “A light to drive out the dark.” They intoned. The six of them split up, with one pair heading down each of the branching tunnels. Jelena and Daantje climbed the central ladder, Jelena first. When she came to the heavy steel manhole, Jelena stopped and waited for Danntje to climb over her. It was cramped, but the lack of heavy armour on either of them made it bearable. Danntje pulled a thin tube from her belt, with a viewing port at one end. She carefully slid the periscope through an opening in the manhole cover and began to look around, whispering her observations back to Jelena. Jelena nodded and checked her watch. Jelena tensed her muscles and got ready to jump. She tapped her radio button three times to warn the rest of the squad, and then hooked her legs around the ladder so that she could place both hands on the manhole cover. Jelena could feel control of the mission slipping away from her. She thought fast, tracing in her mind along the map she had memorised. “Two hundred metres, approximately.” Jelena nodded. That would put them onto their alternate route, around the convention centre to the west. Lord Sebastian Axelthorpe, Earl of Westsphere and the Domain, rapped on the darkened glass separating him from his driver. There was a moment’s pause before the glass partition lowered. “Milord, I-” Nelson protested, but Lord Axelthorpe brushed off the answer and instead turned to the suited man in the passenger seat. Bartholomew didn’t turn around, his sunglass-covered eyes scanning the surrounding environment. Axelthorpe was about to repeat himself when the ISC man responded in measured tones. “Yes Milord.” Axelthorpe’s driver wound a small handle and the glass partition rose once more. He slumped into the soft leather and frowned. It wouldn’t be beyond Her Serenity to send her attack dogs to limit my dealings, he mused. Axelthorpe plucked a crystal glass from the door and leaned forward to reach the bar. He selected a bottle of 30-year-old Drougan Dembovska and uncorked it, smiling to himself as he passed the bottle under his nose. The sour tang of alcohol was almost entirely drowned out by scents of smoke and mahogany. As he tipped the bottle to pour some, the limousine tilted. He righted the bottle once more and glowered. They were descending, he realised. There was a muted response from the other side of the glass that seemed to include the word ‘Milord’. Axelthorpe quickly poured the whiskey and re-corked the bottle. He raised the glass to his lips but was again interrupted by the vehicle tilting back to level ground. He took a swig and let the velvet-smooth liquid slide down his throat. It had the desired effect, and he sighed. A moment later, the limousine bounced. A handful of drops splashed out of the glass and onto Axelthorpe’s dark green trousers. He roared and banged his cane against the glass. “Pull the car over, boy! I’ve had enough! By the light, I’ll see you punished for this!” The car began to slow down, rolling to an eventual stop. Axelthorpe took another swig of his whiskey and rapped on the screen again. There was a long pause. Axelthorpe thought he heard giggling. The screen lowered, but instead of Nelson and the ISC agent, two women’s faces stared back at him. One was long and thin, with a delicate nose and chin framed by a shoulder-length bob of dark blonde hair. The other was flat and round, with a small mouth twisted into an amused grin. Her green eyes sparkled with mirth. “I say, who do you think you are? What buffoonery is this?” Axelthorpe spluttered. The two women looked at each other and shared a smile. The one with the round face looked back at him and the barrel of a massive pistol appeared. The other shifted slightly and he could see a pair of shoulderpads with a cog symbol on them. “Ja, Herr Lord Axelthorpe. A P60 Punisher. Not a subtle weapon, but…” She shrugged. Axelthorpe dived for the Aggressor handgun he kept under the seat. As he did so, the woman with the round face leapt through the narrow gap in the screen. As she tumbled into a seat, she pushed one boot into Axelthorpe’s chest and pinned him in place. The Punisher reappeared, all the more massive now that it was two inches from his right eye. She was clad in fatigues patterned with grey, white and green. Despite the foot and the gun, the rest of her appeared relaxed, almost casual. Somehow she had grabbed his drink at some point, and now she carefully sniffed the glass. “Hmm,” her eyes remained locked with his, “I do not know how you Imperials drink this.” She emptied the whiskey on the floor before crushing the glass into jagged shards in her gloved fist. Axelthorpe’s body didn’t move, but his adam’s apple worked up and down for a moment before he spoke. “Ha! Salary…” She whirled a finger in the air theatrically and her compatriot in the front seat giggled. Axelthorpe looked them over for a long moment. He stared at her. She stared right back. The colour slowly drained from his face. There was a sliver of movement in the corner of his eye and Axelthorpe realised that something had been thrown into the back seat. He looked down to see a small canister sit there for a moment or two before a jet of purple smoke issued from the base of it. It quickly filled the car with an acrid stench that burned in his nostrils and made his eyes water. He groped for the door handle and stumbled out onto the street. He blinked a few times to clear his eyes and looked around. What greeted him was a scene of total chaos. The lead car in his motorcade was crumpled against the nearest support pole for one of the railway bridges. The two men riding in it were slumped on the bonnet, having come through the front windscreen. He looked around and saw the car that was assigned to follow him burning, the charred corpse of another of the security detail lying nearby. Of the two women, there was no sign. Axelthorpe stiffened and leaned heavily against the limousine. He took a few halting steps before he found his driver and Bartholomew sitting against the car. Nelson was rocking back and forward, his face in his hands. Next to him, Bartholomew still had his sunglasses on his head, although that head was sitting neatly in his lap on top of his hands. There was a lipstick kiss marked out on his cheek. “Came… from nowhere…” Nelson was repeating the statement to himself. Axelthorpe opened the limousine door again. The smoke from the canister came billowing out, and he plucked another glass from the rack. He poured himself a generous measure of the whiskey, draining the glass quickly before immediately refilling it. Fiction pieces are an integral part of all Warzone publications, and have been since the first edition. War Stories is a series of short fiction pieces that appear in CTC Magazine each issue. This piece is from issue #1. Have a look at the CTC Magazine archives here, or get a hold of their latest issue here. Also check out their Facebook Page. 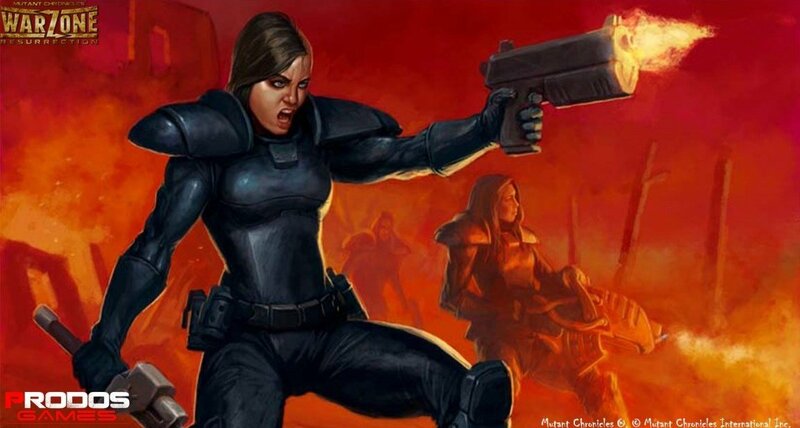 What’s your favourite Warzone/Mutant Chronicles fiction piece?